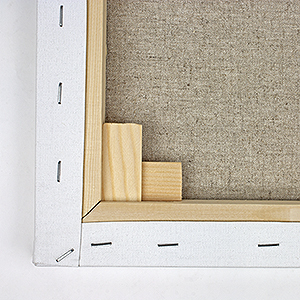 If you've ever bought pre-stretched canvases you may have been suprised to find a small bag of wooden pieces attached to the back of the canvas stretcher. A lot of people wonder what they are actually for; this article should help answer some of your questions! Most pre-stretched and primed canvases will have good enough tension to allow you to start painting on them as soon as they are in your hands. Occasionally you may find that the surface has slackened slightly, before or after you have started painting. In most cases, your canvas will come with a bag of canvas wedges (also known as canvas keys), which can be used to tighten up the tension of your canvas if you find it has loosened. During the painting process, the addition of paint, collage and other elements will burden your canvas with extra weight, which over time can cause the surface to loose its tightness. Environmental factors, such as temperature and humidity, can also cause the material on your canvas to move and shift. If you have completed a painting and find that it is slackening on the stretcher you can use canvas wedges to tighten it back up again. 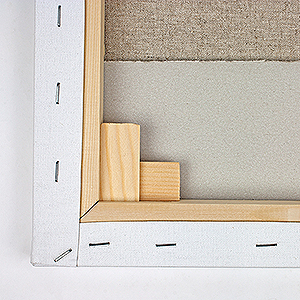 If you have never used canvas wedges before, you can follow the steps below to install them quickly and easily. 1. In each corner of your canvas you will notice some slots cut into the wood. 2. 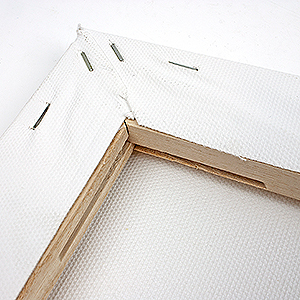 Place each of your canvas wedges into one of the slots in the corners of the canvas. 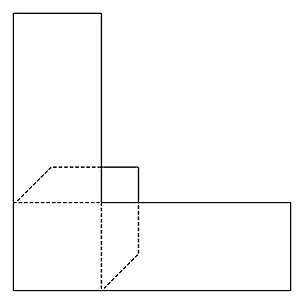 The diagram to the left will help you install them in the right orientation. 3. 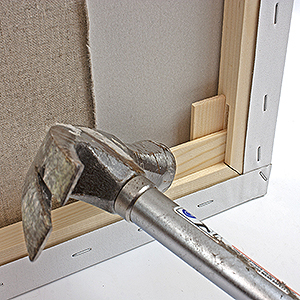 Before you secure the wedges with a hammer, it is a good idea to place a piece of scrap card behind the wedges so that the surface of your canvas will not be damaged by your tools. 4. Stand your canvas upright and use a hammer to gently tap each of the wedges upwards to fit them securely into the wooden slots, while supporting the rest of the canvas with your free hand. 5. 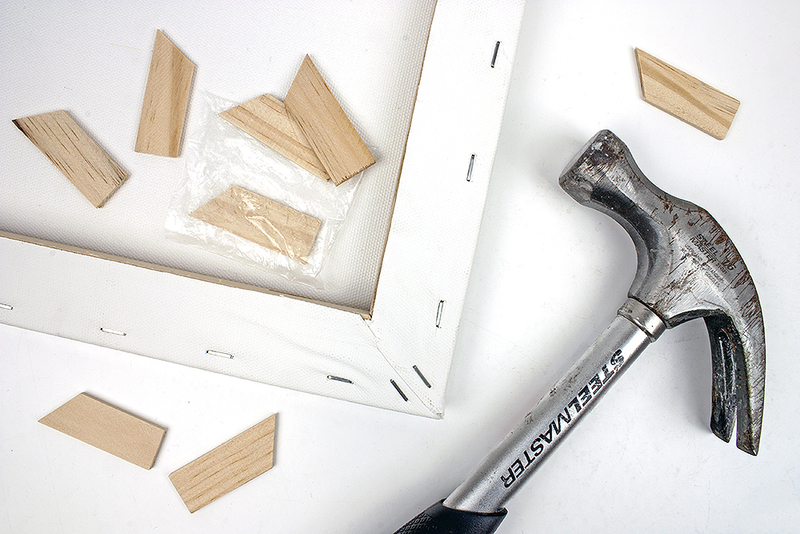 Make sure you use the wedges to move one stretcher at a time, in order to keep the canvas square. 6. 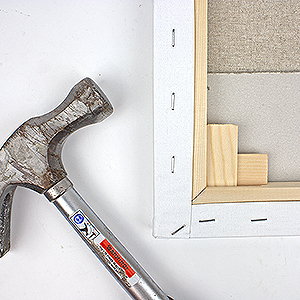 Rotate your canvas and hammer in the remaining wedges until you have achieved your desired tension. Your canvas should now be perfectly stretched!